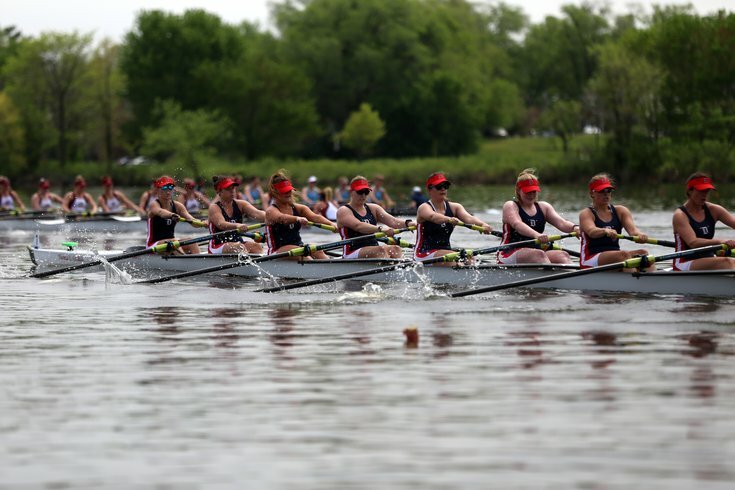 The Duquesne University Women's Coxed Eight rowing team competes last Saturday in the Atlantic 10 Regatta on the Cooper River in Pennsauken, Camden County. No longer silted in, the Cooper River is back to attracting rowers and regattas, including more top-tier crew events, especially for women. Gone is the 24/7 throb of pumps sucking out more than 5,000 truckloads of muck from the dammed section of the river between Route 130 and Cuthbert Boulevard surrounded by Collingswood, Haddon Township, Cherry Hill and Pennsauken. Rowing, typically a six-lane event, was often more like a five-lane event on the Cooper before dredging reshaped the bottom during much of 2016. The sixth lane, fronting South Park Boulevard on the Collingswood and Haddon Township sides of the water, was too shallow, with skegs snapping and oars scraping bottom. “It was awful,” said Hannah Towhey, a 17-year-old with the South Jersey Rowing Club’s junior team. While the Cooper course lacks the history and longevity of Philadelphia’s Schuylkill River venue, which dates back to the 1850s, the Cooper, which was dammed in 1938, is now uniformly fair and fast. That’s not true of the twisty Schuylkill, with its turns and currents. The Cooper course has rebounded, adding contests and events, according to Jamie Stack, director of rowing for Camden County. With increased demand for more events on the water, work is being done to add shuttle parking to accommodate growing throngs of spectators. The venue will host the USRowing Club Nationals for nine days in July. When Elle Caton, 16, moved recently to the Philadelphia region for her dad’s job at Campbell’s in Camden, she checked out both waterways. And while living in West Chester to accommodate the family’s livestock placed her closer to the Schuylkill, she ended up joining the South Jersey Rowing Club, headquartered in the Camden County Boathouse on the Northshore of the Cooper. The women's coxed eight team from Saint Joseph's University competes in the Atlantic 10 Regatta on Cooper River last Saturday. 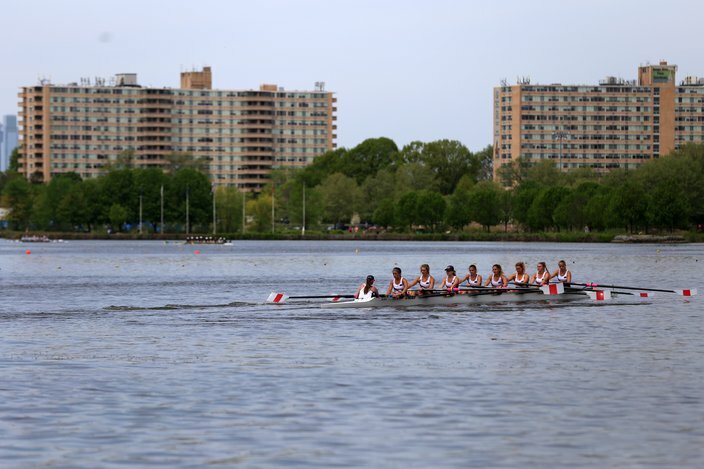 And while it has a 2,000-meter Olympic course, Caton wishes it was just a bit longer for easier turn-arounds, an advantage on the Schuylkill, which also has the storied charm of Boathouse Row. The South Jersey Rowing Club is offering five four-day instructional sessions over the summer. Click here for more information. But Caton knows the Cooper has pulled in some of the top college regattas in the country – last weekend was the Atlantic 10 Women's Rowing Championship and the Ivy League holds its women's championship on the Cooper on Sunday. Such marquee events bring her and her family back to South Jersey even when she’s not competing. “At this point, we’re turning away regattas,” Stack said. Five new regattas have been added since the dredging ended. And while Camden County hasn’t stolen away huge rowing events, the additions are higher-profile contests. New start and finish towers, the last element of the planned improvements to the course, will allow broadcasting an event in real-time from start-to-finish, added Stack, which should add to the Cooper’s appeal. The events have brought perhaps 5,500 new athletes to the Cooper and each crew member probably brings an average of about 1.5 additional people to watch, he said. A dredging pump sits along the banks of the Cooper River as a boat sails nearby on April 13, 2016. 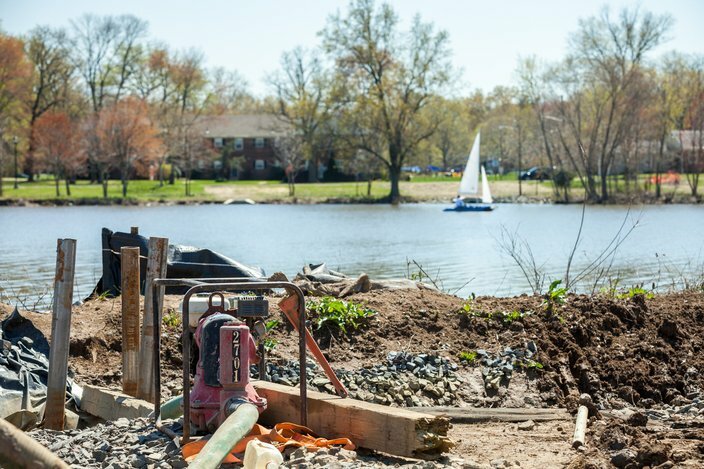 The Camden County project has improved the rowing course on the river and has led some regatta organizers to move their events to the venue. And that translates to motel stays, gas station fill-ups, and runs for ice, Wegman’s and Wawa. With 115,000 cubic yards of sediment sucked from the river bed in a $10 million dredging project two years ago, the water quality has improved, and with it the fishing, said Stack. Gerry Quinlan, the coach at St. Joseph’s University in Philadelphia, thinks of both the Schuylkill and the Cooper as home waters. He said it is actually faster to get to the Cooper at the right time of day, slipping in and out for a few hours of practice while avoiding Philadelphia’s rush hour traffic. For a coach who wants to win, more time on the water and less time commuting is an advantage the Cooper offers, he added. One of the largest and most storied races in the region is planned for the Schuylkill River this Friday and Saturday, the Jefferson Dad Vail Regatta.